As I set out to document all this fun and fancy information about new Titleist balls and clubs and putters, I had a chance to say hi to Mike Rowan, Director of Sales for Acushnet and as expected, Mike had a lot of TOUR validation info in his pocket about these new products. “"The Titleist TS driver story has had immediate impact on the PGA TOUR. In fact, Titleist has been the #1 driver at most PGA Tour events played so far this season including at The Players last week along with the Sony Open, Arnold Plamer Invitational, the Waste Management, the Honda, The Desert Classic and more. I’d also like to add, in some of those tournaments, Titleist earned a clean sweep as the most played ball, driver, fairway, hybrid, irons, wedges and putters by the field. An accomplishment that no other current golf equipment manufacturer can claim." And of course our golf ball story remains dominant. Our new 2019 edition of PROV1 and PROV1X is completely trusted across all TOUR’s, and Through last week’s Players Championship, 5,307 tour players across the globe have trusted Titleist vs the nearest competitor at just 667." Lets look at some of this new equipment for 2019. A two-year mission to design greater speed into every detail of driver technology has led to the introduction of the new Titleist TS drivers. “Titleist Speed Project” began with a challenge from the game’s best players to make Titleist drivers as fast as possible. What followed was a relentless pursuit to solicit speed from every micron and milligram of the driver head, culminating with the development of two new driver models – TS2 and TS3 – engineered to deliver faster ball speed with higher launch, lower spin and increased MOI for more distance and forgiveness. 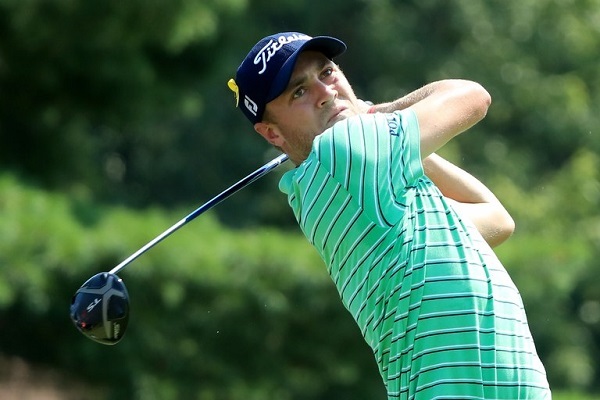 Justin Thomas on new TS metals: “The new TS driver was instantly faster off the club and I was able to get a few more yards carry when needed. More importantly for me, my spin numbers were more consistent therefore it has helped me drive the ball much better. The new TS2 and TS3 fairways provide distinct performance benefits similar to their TS2 and TS3 driver counterparts. TS2 is the longest, most forgiving Titleist fairway wood ever, generating explosive speed with forgiveness and accuracy across the face. TS3 delivers speed-tuned performance through Titleist’s adjustable SureFit CG technology with dynamic forgiveness and shot control. INTRODUCING HIGH OPTIC YELLOW: The improved performance of 2019 Pro V1 and Pro V1x will also have a new preference option: High optic yellow. Following a tour seeding and validation period in early 2019, the new high visibility color option will be available in golf shops this spring. To date, more than 200 players worldwide have put the new Pro V1 and Pro V1x in play.